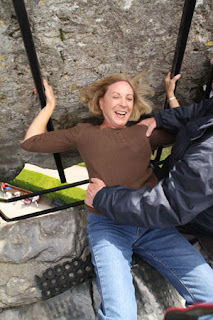 Sure, it’s a touristy thing to do—but I couldn’t pass up the opportunity to kiss the Blarney Stone. So I joined the millions of people who have contorted themselves to follow this ancient ritual--in exchange for a measure of good luck. 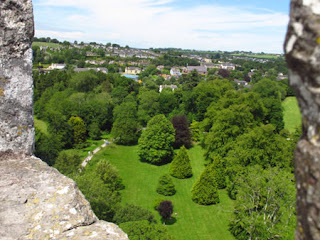 On a warm, sunny day in June, we arrived at Blarney Castle and Gardens in County Cork in southern Ireland. From the entrance we walked about 10 minutes to the Castle, where the world-famous Blarney Stone is located. The iconic stone is at the very top, which means you’ll climb about 100 stone steps to reach it. We passed various rooms in the Castle—the ladies’ room (a place of seclusion and respite, not a restroom), Priest’s room, kitchen, and other rooms once in use that you can stop and explore on the way up (you exit by means of a different stairway). Built nearly six hundred years ago by one of Ireland's greatest chieftains, Cormac MacCarthy, Blarney Castle is arguably Ireland's best known landmark. 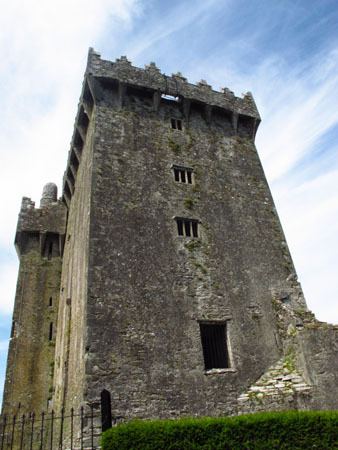 The spiral staircase was fairly dark, with only a few narrow window openings through which to view the surroundings—and the Blarney Stone. backwards plunge to kiss the Stone. It requires lying on your back. At the top, we got in line to kiss the stone. My husband Larry decided to be photographer after watching others lean precariously backwards, but I’m usually game for a challenge. An attendant holds onto your legs for stability, but you must lean back and stick your head through an open area while gripping two black iron poles. The procedure requires a bit of flexibility and a whole lot of trust. Nevermind that millions of people have smooched the stone before you, go ahead and pucker up with a big smack—so everyone knows you really did the deed. If you’re inclined you can purchase official photos and certificates later at the shop in the Castle—wonderful souvenirs to document your experience. Once back on the ground, we looked up towards the opening and snapped photos of the Castle and Blarney Stone from below. Spend time enjoying the grounds. After admiring my courage, we wandered around the gardens and paths of the castle grounds for almost an hour. More than 60 acres of sprawling vistas include blooming flowers, avenues, arboretums, and waterways. Our summer scene included a splendid display of color from rose beds and herbaceous borders. Otters and a family of swans have taken up residence on Blarney Lake, and you might see squirrels and jays in the surrounding woodlands. There’s even a Poison Garden, an educational collection of poisonous plants from around the world, behind the Castle battlements. The trail to the Rock Close and Water Garden leads to the “Wishing Steps.” Legend says if you walk down the steps backwards with your eyes shut, all your wishes will come true. Of course, falling down takes away the magic. Because of its reputation, Blarney Castle and Gardens evoke a bit of mystery, but it’s a captivating place to spend a couple of hours.